Researchers led by SDSU professor Peter Andersen have teamed up with 40 resorts to encourage vacationers to be smart about sun safety. A group of researchers led by San Diego State University communication professor Peter Andersen have teamed up with 40 resorts nationwide to encourage vacationers to be smart about sun protection through Go Sun Smart. The program, funded by the National Institute of Health, kicked off in March at the PGA Golf Resort in Palm Beach, Florida, and Lago Mar Resort and Club in Fort Lauderdale, Florida. It will continue to roll out to resorts all over North America this summer. 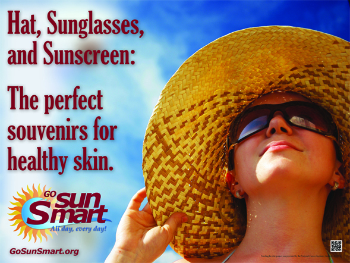 Sun Smart is a partnership between SDSU and Klein Buendel Inc., a health communication firm in Golden Colorado. Researchers from a variety of disciplines, including communication, epidemiology, biostatisics, public health and hospitality, are working together on the four-year project. They have created a comprehensive communication campaign for resorts to use to communicate the importance of sun safety to guests from the time they make their reservations until they check out. “One of the primary reasons guests have negative experiences on vacation stems from sunburns,” said professor Larry Beck from SDSU’s School of Hospitality and Tourism Management, a co-investigator on the project. “From the hospitality perspective, this is a win-win situation. The resort is showing concern over the health and well-being of their guests, which reflects positively on the resort, and guests are less likely to become sunburned, so they will enjoy their trip more and may avoid skin cancer in the future." The program is endorsed by the Hospitality Sales and Marketing Association International and the American Hotel and Lodging Association. “The American Hotel and Lodging Association and its members would benefit from learning how to use Go Sun Smart to promote sun safety and enhance the experience of our guests,” said Joe McInerney, president of the association. Researchers have spent two years studying the sun safety behavior of guests at 18 resorts. This year, 22 more resorts have been added. In an effort to measure the effectiveness of the campaign, they will continue to observe resort guests and conduct interviews to see how sun safety behavior changes over time. “Ninety percent of people know the sun causes skin cancer, but most people don’t realize all of ways they can actually prevent it,” said Andersen. Resorts participating include Sun Peaks Resort in British Columbia, the Omni Mount Washington Resort in New Hampshire, Jackson Hole Resort in Wyoming, Rancho de los Caballeros in Arizona and the Miramonte Resort and Spa in California.